Blue sapphire is considered a primary color gemstone; the purer the primary hue, the more valuable the gemstone. Blue sapphires are colored by trace amounts of titanium and iron. (By increasing the level of titanium and iron the color saturation is also increased.) The most common secondary hues found in blue sapphires are purple, violet, and green. Violet and purple can contribute to the overall beauty of the color, while green is considered to be the bane of a blue sapphire. The problem is that all blue sapphires will have a greenish component when viewed at the right angle. It is the cutter that makes sure that the green is not part of the face up position in a sapphire. When gray is included in the overall color of the gemstone, often referred to as a gray mask, the sapphire will have a cool or steely quality as opposed to the normal warm velvety hue of a sapphire. Gray is the normal saturation modifier or mask found in blue sapphires and will often mix with green. Blue sapphires that are eye-clean or entirely free of inclusions are uncommon, especially in larger sizes. However, blue sapphires with some internal inclusions are still highly valued, as long as the inclusions do not reduce brilliance, obscure color, or otherwise detract from the gemstone’s beauty. Blue sapphires of one-carat weight or more are not usually cut to calibrated sizes or standard shapes. Each gemstone is shaped to maximize the color and weight of the gemstone. In blue sapphires, cutting can influence color in surprising ways. Sapphires are dichroic gemstone, meaning their color varies depending on the angle from which it is viewed. 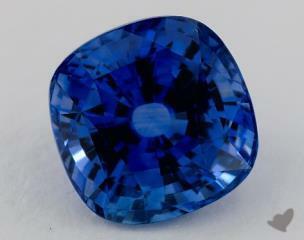 Viewed in one direction, most blue sapphires appear blue to violet-blue. From another direction, they will appear slightly greenish blue. A skilled cutter will orient their gemstone so that the blue to violet-blue color shows through the finished gem’s crown. Silk inclusions are also acceptable in blue sapphires, as long as they are not so dense as to compromise color or brilliance. In fact, silk inclusions can increase the value of a sapphire. The heat treatments used to alter color and clarity in blue sapphires break down rutile silk, so the presence of intact silk indicates that a sapphire is unheated. Certain other solid and liquid inclusions burst or deform under extreme heat and are also useful indicators of heat treatment. Heat treatment and diffusion make attractive blue sapphires out of common corundum that would have little or no value without treatment. Heat treatment is widely used in the international sapphire market, and it is estimated that well over 90 percent of all blue sapphire in the market today has been subject to heat treatment. Diffusion treatment is far more controversial, and diffusion-treated blue sapphires sell for much less than those which have only been heat-treated. Blue sapphires are found in a number of locations around the world including Kashmir, Myanmar, Sri Lanka, Madagascar, Thailand, Australia, Tanzania, and the state of Montana in the United States.